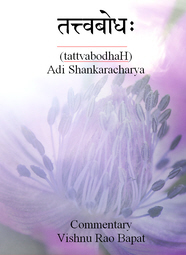 Part 31 of the commentary by Dr. VIshnu Bapat on Shankara’s Tattvabodha.This is a key work which introduces all of the key concepts of Advaita in a systematic manner. Part 31 provides the bare Sanskrit shlokas in Devanagari script and concludes this series. Part 30 of the commentary by Dr. VIshnu Bapat on Shankara’s Tattvabodha.This is a key work which introduces all of the key concepts of Advaita in a systematic manner. Part 30 provides a short summary of the entire work. Part 29 of the commentary by Dr. VIshnu Bapat on Shankara’s Tattvabodha.This is a key work which introduces all of the key concepts of Advaita in a systematic manner. Part 29 explains what happens to the j~nAnI and his accumualted karma on enlightenment. Part 28 of the commentary by Dr. VIshnu Bapat on Shankara’s Tattvabodha.This is a key work which introduces all of the key concepts of Advaita in a systematic manner. Part 28 explains why saMchita and AgAmi karma are eradicated on the gaining of Self-knowledge. Part 27 of the commentary by Dr. VIshnu Bapat on Shankara’s Tattvabodha.This is a key work which introduces all of the key concepts of Advaita in a systematic manner. Part 27 looks at saMchita and prArabdha karma. Part 26 of the commentary by Dr. VIshnu Bapat on Shankara’s Tattvabodha.This is a key work which introduces all of the key concepts of Advaita in a systematic manner. Part 26 begins the description of the types of action and their fruit in the form of the three karmas. Part 25 of the commentary by Dr. VIshnu Bapat on Shankara’s Tattvabodha.This is a key work which introduces all of the key concepts of Advaita in a systematic manner. Part 25 concludes the description of a jIvanmukta and asks what is the benefit of removal of ignorance. Part 24 of the commentary by Dr. VIshnu Bapat on Shankara’s Tattvabodha.This is a key work which introduces all of the key concepts of Advaita in a systematic manner. Part 24 asks how we become ‘liberated’ and begins the description of a jIvanmukta. Part 23 of the commentary by Dr. VIshnu Bapat on Shankara’s Tattvabodha.This is a key work which introduces all of the key concepts of Advaita in a systematic manner. Part 23 continues the enquiry into the statement ‘you are That’ (tat tvam asi) and looks at the meaning of ‘you’ and ‘That’. Part 22 of the commentary by Dr. VIshnu Bapat on Shankara’s Tattvabodha.This is a key work which introduces all of the key concepts of Advaita in a systematic manner. Part 22 begins the enquiry into the statement ‘That thou art’ (tat tvam asi) and looks at the differences between AtmA and jIva.